our military shadow box, military shadow box ideas are Beautiful, wooden Display Frame to showcase your proudly earned medals and distinctions. This Display Frame can also hold pictures of your loved one wearing his/her military uniform. This Display Frame comes in a variety of wood and will be an heirloom that will be cherished throughout the generations. This custom made Display Case can be personalized with your solidiers name. It comes with a wide choice of background colors. Give the gift that will be sure to please your family and highlight the proud service that your loved has done to protect our country. The cases and shadow boxes are fronted using high quality Plexiglas. Each display case is American-made product. You have a choice of the type of finish you would like on your case. Optional engraving for your flag case are available . Shadow boxes and certificate holders are available in variety of styles to match your need, and to preset your photos and medals in a great case. display cases include wood finished to match the flag case. Optional engraving for your flag case are available. Each Display Case is constructed from premium woods and hand finished to bring out the natural beauty of the wood, and made to fit your needs. This Military Case is constructed as a shadow box and doubles as a photo holder. This double use makes the display case great as a photo display case, a military award display case, a veteran display case, a police display case, a memorial display case, a Navy display case, an Army display case, and a medallion case. Size : 26” (H) x 21” ( W) x 1.5” (D). Contents are protected with a high-quality glass façade, using the best-Plexigas. Store everything in this case and shadow box and never worry about misplacing your treasures! This Military Case is available in a deep, rich black finish, although you have a choice of the type of finish you would like on your case. 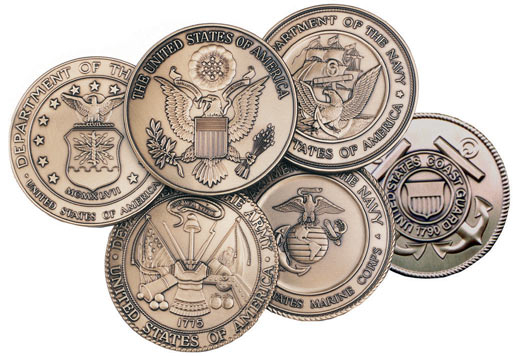 As with all of our display cases, the Military Case is an American-made product. Each display case is constructed from premium woods and hand-finished to bring out the natural beauty of the wood and made to fit your needs. Optional engraving for your f case is available. 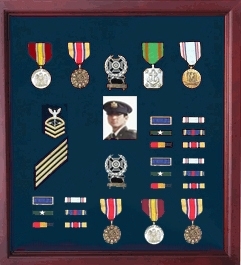 Orders for the Military Medal Case, Shadow Box photo Holder, Military Medal are usually shipped out within one business day to places within the USA and Canada.